This dish was one of the recipes I helped developed last year for a Filipino restaurant. The restaurant plans didn't pan out as I hoped but I still enjoy some of the creations we came up with, with this being one of them. Now I'm sharing it since it's too good to keep to myself! The original name for this dish was 'Kamayan Shrimp.' Kamayan is a Filipino/Tagalog term used when eating with our hands... and this is one dish that you really want to get your hands into. The secret to this dish is using tempura flour with some seasoning as a dry coating before frying. No need to mix the tempura into a batter with water. Simply add the seasoning with the flour, toss the shrimp in it to coat and fry. The result is a nice, light, seasoned coating that maintains the delicate texture of shrimp. The next part is the citrus sauce. In Philippines, calamansi is a popular fruit which has a flavor reminiscent of lemon and tangerine. It's not easy to find fresh calamansi here in Chicago, so I often resort to frozen calamansi juice or even shelf stable calamansi concentrate. My friends who are in Florida and California can probably find fresh calamansi... so if you can find it, use it! Otherwise, if calamansi isn't readily accessible, a good substitute a mixture of fresh lemon and tangerine juice. The sauce is made by cooking down some juice with a touch of sugar and adding some melted butter. 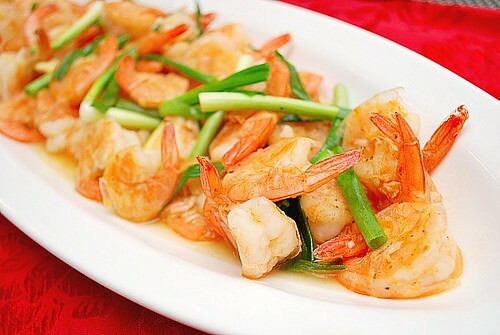 The crispy shrimp is tossed with the sauce just to lightly coat them right before serving. Preheat oil to 350 degrees for deep frying shrimp. Meanwhile, in a large bowl, combine the tempura flour and seasoned salt. Add the shrimp and toss to coat. When the oil is hot and comes to temperature, add the coated shrimp in batches and cook until crisp, about 1-2 minutes. Remove shrimp and transfer to a towel lined plate to drain of excess oil. For the sauce, in a shallow pan over medium high heat, add the juice and sugar. Allow to the juice to reduce down to half, about 3-4 minutes. Add the butter a tablespoon at a time and allow to melt. Once all the butter has been added and melted, remove from heat and add the drained shrimp. Toss to coat lightly and transfer to a serving platter. Garnish with green onion and serve immediately... and don't feel shy about eating them with your hands!